Gareth Huw Davies - Free our best friend - time to walk the dog out of pedigree status? Why should somebody like me, who does not own a dog, who has never owned a dog, be interested in a book with the cover tagline “a must read for all dog lovers”? Predisposed to dismiss it as uninteresting reading, I took a dip inside and quickly concluded that the tagline does the book a disservice. It was clear, after a few random pages, that it wasn’t really a book about dogs at all, but about people. Michael Brandow sets out his thesis: “My subject is not dogs but the humans hooked on their looks“. So this meticulously researched, very readable, and often darkly amusing book is about the people who, for the past several centuries, have obsessively manipulated the shape, colour and vital statistics of the dog for reasons of pride, snobbery and finely calibrated competition, where that the slide rule matters more than the stop watch. We can’t deny that, on the pavement or sidewalk, fancy dogs bring a lot of harmless social interaction. Owning smart breeds brings people together. There is a big fraternity (and maybe a smaller sorority) of pedigree dog owners, who like nothing better than to stop and talk with other pedigree owners and “play the guessing game”. Before we proceed, it’s time for full disclosure. I don’t wish to offend friends and family members, who have derived lasting satisfaction, which in one case has lasted their entire adult lives, as the owners of certain breeds of pedigree dogs. I’ve shared these dogs’ company on many a long and rewarding walk. I see nobility, and an awesome sense of trust. In turn their owners have shown exemplary devotion and care, and spent large sums on their health and welfare. And spend money they must, for the pedigree dog, according to Michael Brandow, on the whole, is a precarious genetic fabrication, full of flaws, usually small, but sometimes so serious as to limit their movements and render their lives an apparent misery. And not uncommonly, to shorten it. “There can be no longer any doubt. Ample studies confirm that requiring breeds to be distinctive has led to dramatically high levels of cancer, structural deformities, skin conditions, ear and eye infections and multiplying afflictions. Many purebreds are in peril and dog lovers must confront this sad reality.” In fact some breeds are so prone to health issues that they risk having diseases named after them. Brandow, as well as being a very good writer, has a deep knowledge of his subjects. He is a professional dog walker, who pounds the sidewalks of Manhattan with other peoples’ prize pooches, He is also an expert commentator on pedigree dogs. A rather painful chapter about him walking (or really carrying) a bulldog – “how on earth did anyone ever get the idea that there was anything cute about these dogs?” – shows how far people, we must assume innocently, allow the dog’s discomfort to develop. The really serious pursuit of “perfection” in the dog seems to have started in Britain. (The very start of the dog, when wolves came out of the cold to edge around primitive man’s campfires, and became father, and mother, of every subsequent dog was only scientifically agreed in the 1990s.) At least many of the original pedigree dogs could be said to perform a useful service – in rushing around the grouse moor, or splashing about in the reeds to retrieve the game birds put down by the hot-shot aristocracy. Function turned into affectation. The purebred dog became a badge of status. And a matter of fierce competition. Dog fanciers applied ever more stringent conditions to qualify for purebred show status. The pet had to satisfy judges on the length of the muzzle, the angle of the tail, and fine nuances of colour you only otherwise find on the paint shelves of the hardware store. “Exacting rules for the canine form assume a complexity that pushes the limits of common sense, and drags us back into a dark and primitive world of secret incantations and weird geometrical formulas.” Not only were perfectly good dogs rejected for some imperceptible blemish, many, until quite recently, were culled at birth. If the British, and the dog show judges, started the drive to the ever more microscopically-differentiated dog breed, the Americans soon joined in and were guilty of simliar excesses. Snobbery and social status was a dominating passion. Americans felt they were above showing deference to the English. “They decided to go that extra mile; they went to England and bought the store.” Self-made magnates, when they weren’t collecting foreign castles and statues, were importing entire kennels from the British Isles. US socialites set the pedigree dog on an equally high pedestal. But there were perils in conspicuous public display. Brandon cites an amusing example, from 1893, of the drawbacks of flaunting your status at the end of a leash, or even on the seat next to you on a train (which you couldn’t avoid using, even as a millionaire, on a long journey before there were cars). There is a dark side to dog breeding, with regular tragic outcomes. (If it were ISIS visiting such injury on people, there would be armed sentries on every dog-walking route.) Brandow notes that unnatural aggression is one of the side effects of inbreeding fighting dogs, and even as I was writing this I heard a news report of the killing of a baby by an American pit bull in the UK. Another recent story referred to police trying to trace the owner of a Staffordshire bull terrier that attacked children at a park in Northumberland. “The dog bit about 14 kids,” said an onlooker. “It was like a terrorist attack. There were injured kids lying all over the place.” Police in Nottinghamshire, where the seizure of banned breeds and dangerous legal breeds has increased eightfold in the past three years, say they believe the rise is largely due to “irresponsible backstreet breeding”. Criminal activity is harder to control, but Brandow offers two paths the peace-loving dog lover might take, leading out of the troubling world of the pedigree and purebred, which seem to be essentially the same thing. 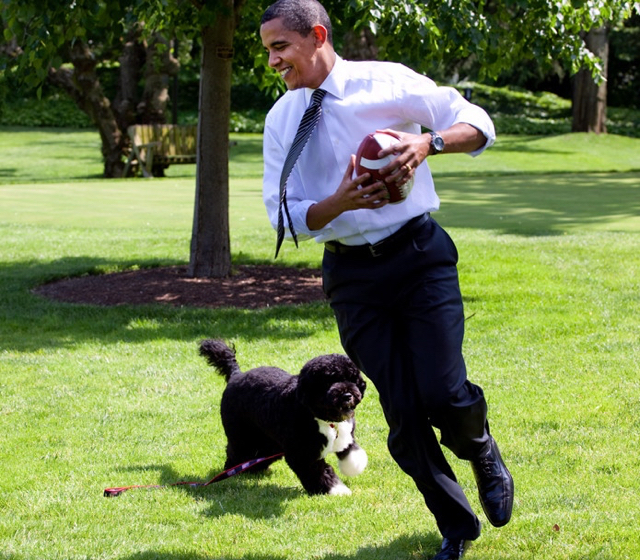 One is to consider a rescue dog, as the Obamas did, acquiring two Portuguese water dogs for the White House. Just enjoy the dog for what it is, not a badge of your own particular status. A Matter of Breeding (A Biting History of Pedigree Dogs), by Michael Brandow, Duckworth Overlook, £12.99.